I meet Arve Henriksen for the appointment in front of the Hotel Norge in the centre of Bergen during a pause between the thousands of things he has to do (after the rehearsal with Trio Medieval at the Logen Theatre and before the mini-show of "folk" music for "OiOi" festival reviewed in the "Io c'ero" section (only in Italian). His way of being and the nature around us are immediately obvious when he invites me to go to a park close-by near a big fountain where it is more peaceful, but more importantly, a place where the nature (so ever-present in his last record Strjon) all around makes his feel more relaxed (that's what I think). 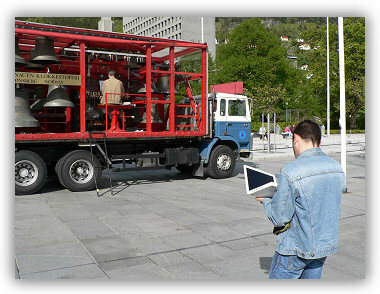 While walking there, something strange happened, we met a "strange artist" who was playing an instrument (mounted on a cart) that looked like an organ but in fact played bells, the sound is quite delightful and Henriksen, amused, opens his Notebook (Apple of course) and starts recording, at the end of which we start the interview. L.V. : First of all, I would like to compliment you for "Strion", after "Sakuteiki" and "Chiaroscuro" it was not easy to make an album as beautiful and original and, most of all, different from the Supersilent with three out of the four components. Are you happy with the result? Will you be making a European Tour to promote it? Henriksen: In first I'm very satisfied and very happy with this recording and I must say it's been a great pleasure working with Helge Sten who produced this record and Stale's (Ståle Storløkken – member of Supersilent) contribution has been fantastic. The thing is that we are trying to make a tour, but I rather would like to go with Supersilent instead.We are trying to put together a tour with Supersilent in September and then we will. But I will do a tour in October visiting Germany, France, Ireland and I'm not quite sure if we have the chance to go to Italy, but my management is working on this now so we will see if we can do it. L.V. : Your work to date shows that you are a great ‘explorer', each record is a surprise, each concert a unique performance: it is clear that you are full of creative youth that naturally we all hope will be long-lasting. But aren't you afraid that the creative streak will run out? Aren't you afraid that you will make records that, for sure will be beautiful, but they will be a shadow of something that you've already done? And if so, do you have any ‘preventive therapy' to avoid it? Henriksen: Ha-ha-ha (laugh)....well, this is always a challenge for artists because we are always afraid of repeating ourselves but if you listen to Garbarek or other musicians today they can produce many records with the same concept and the same band playing just melodies and doing nice material. So, I think many artists just go on making variations of the same theme and for myself I've been trying to make different records. These three solo albums are all a bit different. The next one that I'm working on right now has a obvious link to the record of the "Chiaroscuro" record, but I'm not afraid of doing that, because the Chiaroscuro had a certain, special sound and I think there are some more things there to be explored.I'm not afraid of repeating myself in the sense of making variations of the same concept but after that coming record, I have to do something really drastic, (HaHaHa - laugh) I just want to make one more record with this concept and then hopefully I will do something else, maybe more powerful, more rhythmically, maybe playing some drum kit myself on my solo album – I don't know, I really would like to do something different. L.V. 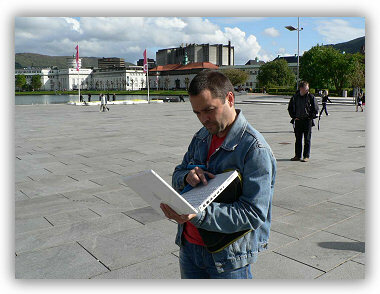 : Of the artists that you have never worked with, with which would you like to collaborate, Norwegian or otherwise? Henriksen: Of course there are many Norwegians that I haven't had the chance to work with, Sidsel Endresen the singer, we talked about this two weeks ago that maybe we could do something next year we could meet and see if we could have a gig together, it would be very interesting - I really admire her work – of course there are many other Norwegians.It would be fantastic to work with Jan Garbarek someday....or Bill Frisell ...maybe one day. I have so many nice projects with Supersilent and Christian Wallumrød right now so for the time being I just try to focus on those things and maybe in one or two years time I can try to do more and explore more with different musicians. Henriksen: Yes, yes absolutely ! L.V. : What part do electronics play in your music? Do your compositions come from the computer or do you improvise and compose at the keyboard or on the trumpet? Henriksen: you know, in many ways actually, some times I just record the concepts I play and then I do a lot of improvisation and sometimes I just listen to the recording from the concert and then we just go in there and cut out the things that we would really like to use. Then we focus on those parts and we delete or add more trumpet or more keyboards or whatever to make it more strong and precise, so that's one way I can do it, but also I sometimes sit by the piano and I make some chord changes or some melodies but I must say that most of the time I just improvise stuff and compose like that. So improvisation is my leading way of working. L.V. : Your skills and the originality of your ‘sound' mean that you are one of the most sought-after "sidemen" today. Do you feel you get something out of every situation to increase your own value, or do these situations in reality distract you from your projects? L.V. : I think that is very different to plays with David Sylvian, or Sinikka Langeland, or Frode Haltli, are very different situations.. L.V. : By now the whole world has discovered your talent, the UK Guardian speaks glowingly of you, in japan they invite you to play, at Moers last year you were the resident artist, Fresu invites you to Berchidda, do you feel that you have ‘emerged' on an international scale or is everything like before? Henriksen: I have achieved a lot of nice things in my career, but I'm not thinking of that so much.My goal is not to become famous or to have a world wide recognition of my work, I just keep on doing the things I've been doing all the way and I get inspired by all the musicians that are around me, all the musicians and all these people, I feel that its more important to be a part of a certain band, I mean, its fantastic to be a part of Supersilent and we feel that we are a band, four members that we go around and we have this nice response, so I'm not so, well sometimes its very nice to get invitations from around the world and you think that wow this is fantastic, but I'm not thinking so much about that, I tried to just focus on playing and creating nice music and as long as I keep that focus I think that that's most important – because if you start to be, or get this kind of attitude of being a certain important star or whatever, then you are out of focus and I don't want to lose the focus. Henriksen: it is. i have had the chance to play with fantastic musicians and when you are invited to a festival to play, you know, they like what I am doing and they like this kind of concept that I can bring along. At the concert yesterday I improvised some Norwegian texts about going to Gardermoen airport. I made up story about all this weird stuff that you see there and when you can add these things in a natural way at a concert then people can have a little laugh about,and the next moment you go into a more serious mood and then will follow you there as well– so I'm walking on this balance between being able to let people have a laugh and in the next moment get a bit serious.its always, there is a mix of many different moods and we can "walk" between them. L.V. : It's very nice because people interact with you and they can enjoy of special unique show and exit fully enjoiedHenriksen: oh that's good, wow!! That's Fantastic!The voice is used much less in the last record, is this a sign of things to come? It would be a shame because the voice has been really important in your albums and concerts, like an "angel" or like a "shaman" (I don' know if this word exixts in Norway) at the same time. L.V. : Is there a question that no-one has ever asked you but that you would like you to answer? L.V. : And one that everybody always asks that you are really fed up with answering? L.V. : If you hadn't become a musician, what would you have liked to do or become? L.V. : Is there a new talent that you would like to mention, someone that you think will have a great future as an explorer like you (not necessarily a trumpet player)?